Many FINE weeks remain OPEN for the summer WEEKS. We are now discounting Jan 2020 and booking NOW allows you to avoid the industry norm of end of the year price increases. 727-595-5727. Here is our 98th REVIEW which recently arrived !!! and covers a VERY CURRENT Feb. 2019. We found the perfect spot for a 2 week getaway to relax and enjoy the Florida weather! This condo is beautifully kept and you can tell the owners are very proud of this lovely property. Susan & Vic were attentive to us both before and during our visit. I doubt that you will find a more spotless condo in this area and the views from this balcony are spectacular! The building is quiet.The wifi worked well. The condo is conveniently located near nice restaurants and positioned within walking distance to a great coffee house to start our morning with a walk on the beach.The garage made it easy to store a bicycle and provided extra protection for our car. We look forward to returning to this 'Peach" next year to refresh & recharge from the Northern Midwest winter! What better way to spend your summer or fall holiday vacation, than in Florida, directly on the Gulf, enjoying the warm waters, sunshine and the beautiful, white sandy beach, which can be seen directly from your private balcony We look forward to TALKING with you. Happy to answer any and all questions. Susan, evenings best at 727-595-5727. Also, let it be know that we are now discounting the Jan 2020 time period. TOP FLOOR & DIRECT GULF balcony. Entire building newly painted. The unit now has a new washer/dryer, M/W and refrigerator, as well as new ten foot floor to ceiling drapes in Living room. YOU WILL LIKE IT ALL. 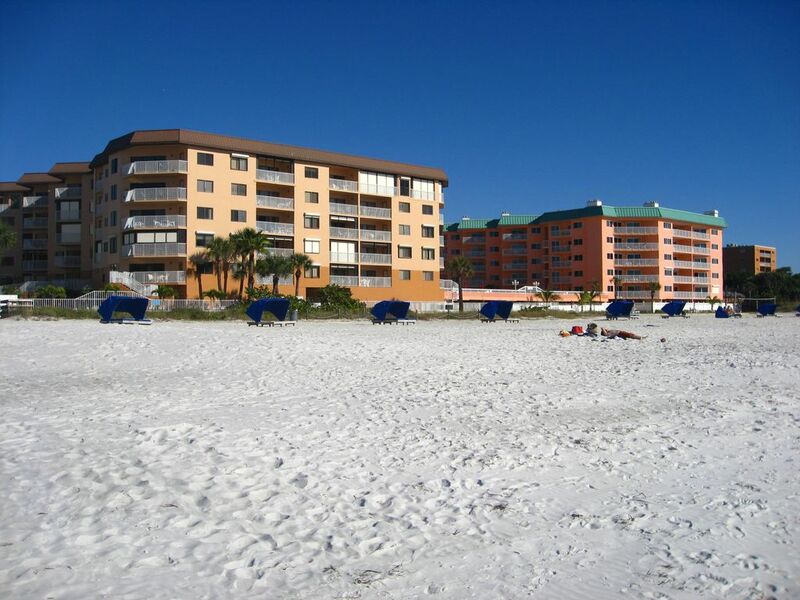 PEACH ON THE BEACH, in the Beach Palms complex, is a DIRECT GULF, TOP FLOOR unit with a garage. We offer LOCATION, location and LOCATION with GREAT sunsets and beach access. YOU will be right out there for the magnificent views and the glorious sunsets. This is "the" special beach front, penthouse vacation condo that you are looking for. Look to the North, WEST, and South at the GREAT BEACH, from the Peach's very own direct Gulf balcony. Nothing blocks your view of the Gulf of Mexico. 2/br-2/ba Direct Gulf unit on the 5th (top) floor with CLEAR views, up and down the entire BEACH, from your personal balcony. The PEACH is updated, upscale & CLEAN, and includes a garage, with beach toys too. New micro-fiber furniture in the living room, including a very comfortable chaise lounge. When you walk into the "PEACH" you will appreciate the open feeling that the 10 foot ceilings provide. The - NEW- full floor to ceiling drapes supply a feeling of warmth in the unit. Free WiFi, with HD TV in living room and cable in the master and guest bedrooms. The unit also has Air conditioning (brand new system) as well as a full kitchen with all utensils provided and a NEW washer and dryer. Visitors rave about how comfortable our king sized bed is in the master bedroom (all linens provided). The master bedroom, bathroom offers a SEPARATE tub and walk-in shower. Also, the walk-in closet seems to be greatly appreciated, by many of our visitors. Finally, new ceiling fans and twin beds in the second bedroom. Located on the barrier island town of Indian Shores, Beach Palms (formerly Beach Cottage III) is DIRECTLY on the BEACH with two glass elevators, a heated pool, BBQ's and enclosed garage filled with everything you and yours will need for the beach..
Susan and I (Vic) have lived and rented beachfront condos for over 30 years. Susan hails from upstate NY (Cortland) and has lived locally here in the Clearwater/St Pete area, for many years. I grew up and lived in the Chicago/Peoria area coming to Florida 30 years ago. This is when I was lucky enough to have met and married Susan. She graduated from the Univ. of South Florida and I received my degree from Bradley Univ. in Peoria, IL. Susan is a 30 year retired Pinellas County teacher (K) and very proud of it. Finally, I convinced her to join me in retirement. Enough about us, what about you and yours? Susan has the patience and knowledge to help anyone intending to visit this area. We have put our hearts and souls into making our direct beachfront condo one of the BEST on the beach. Add to that the direct, top floor location and you have a winner for your holiday. Worried about you car, then you will love our garage. How many condos offer you a garage? Best of all, is the unobstructed view from the private balcony, directly over the Gulf. Please, take a look at our pictures and you will see the exact Gulf views, of the entire beach. Each yea,r we make improvements in the unit. In 2015, we put in a new tray kitchen ceiling with LED lighting and a new chandelier in the dinning room. Last yea,r it was new micro-fiber living room furniture, including a chaise lounge, and the year before that we added free WiFi and HD TV in the living room. In the previous year, we put new tile in the entry hallways, kitchen and both bathrooms. The list goes on and on, but we hope you get the idea!!! This place is maintained to very high standards, which we hope our visitors will appreciate and enjoy. If you plan to visit the area, you need someone you can trust, which describes us. Tired of dealing with fast talking, rude, only interested in getting your booking people? That is NOT us. We like the old fashioned telephone, so that we can describe everything in full and to your complete satisfaction. We have been as honest as we possibly can be, with our pictures. We see pictures on the internet that are taken at the best possible angles, that represent views, that the complex offers, that make not true to the actual unit. We just shake our heads and feel sorry for the folks who get fooled' by such half truths. This is one reason we meet and greet our visitors in person. We view the grounds together and walk into the unit with you. Someone not happy? This has yet to happened. If it were to occur, we would talk about it 'on the spot' and work it out. Finally, since we meet and greet all of our visitors, we provide the keys, so you do not need to drive up and down the beach (or fool with a lock box) to get keys. No doubt, flying or driving you will be tired and who needs to look for the whereabouts of the keys? Finally, since we have built a two way 'faith and trust' on the telephone, we have NO need to ask you to pay in advance. Payment is upon arrival. Many operations (most, if not all) ask you to pay in advance. Doesn't that make you feel a bit uncomfortable? It does when we travel. We do ask for a reservation deposit, when you book the condo. This assures us, that you are indeed coming and makes us feel better about turning others away for the dates you have reserved. Split bathroom floor plan allows privacy between bathrooms. The fine white sand found on our beach is well known worldwide. This PEACH looks over that sand and directly at the Gulf. Our beach is beautiful and is not too wide and not too short, but just right. Check out our pictures taken from our balcony. We are "RIGHT OUT THERE" just what visitors want and deserve when visiting. Again, check out our pics taken from our balcony to the South/North and, yes, directly to the west (The Gulf of Mexico). None better. Open view to the North/ South, and, of course to the West, from YOUR balcony. The unit is on the top floor of a five story building, so the view is EXTRA special. Not even a pool between you and the Gulf of Mexico, just some beautiful sand. "THE VIEW" most visitors want. Talk about location, location, this unit has it. SUPER SUNSETS, from your balcony. Provided in both bedrooms. Plenty of extra pillows and blankets, as well. One car. beach toys with a wagon for use to/from the beach. HD in living room and basic cable in both bedrooms. All flat screens. With a straight out view of the Gulf-of-Mexico. Also a great view to both the North and the south. Clean and stocked with anything you need for a vacation. Garage with items for use at pool or on the beach, The owners are like your friend when you meet Susan upon checking in. The feeling of belonging in a new place instead of feeling out of place,,,What a wonderful place to stay on vacation. Wonderful view! Comfortable & well-equipped unit! We've stayed in three different units at Beach Palms and this one was by far the best! The view was fabulous. The beds were comfortable. It was completely outfitted with everything we could possibly have needed from linens to kitchen items to beach toys. Very nice and responsive owners. It was a wonderful experience overall and I'd recommend it to anyone looking for a memorable stay in Indian Shores! Thank you for taking such good care of our condo, during your stay. You are a lovely family and we look forward to more visits from you, in the near future. The beach and pool area where very clean. We spent most of our time with our two young sons in the pool and some at the beach. It's a great place for a family. We took our boys to the alligator exhibit in John Pass Village- that was great for them! We also ate at Keegan's Seafood Restaurant. We LOVED IT! 2.The twin beds in the second bedroom seemed a little old and could probably benefit from an upgrade. My husband slept in that room with my 4 year old son and he said it wasn't very comfy. The master bed, however, was very comfortable. 3. Lastly, the carpet could probably use replacing. There were rugs and runners all over the apartment to help keep the carpet from wearing. While I appreciate and understand what they are trying to do, I ended up having to move some out of the way because I tripped on them a few time. A suggestion I have for guests coming: You might consider bringing some saran wrap/foil, plastic baggies, olive oil for cooking and other items that you regularly use in the kitchen as there were very little to none provided. It would have been nice to have some of those things included. In a place we previously rented for a vacation most of that was provided so we didn't have to go out and buy it just for a week. I would have easily paid an extra fee to have (paper towel, olive oil, saran wrap, foil, and baggies) or other items provided for us in the kitchen. Overall, we had a great time. I would recommend this rental to anyone with a young family. The space was ample enough for our family of 4. We would definitely consider renting this property again! Overall a GREAT unit and so happy that you would recommend it all. We hope to see you again in the future. If the size of this condo fits your needs, your search is over! I have been vacationing on the Gulf Coast for many years and this rental is by far the nicest, cleanest, most well appointed "peach" on the beach that I have ever had the pleasure of calling "home" for a week. Susan was absolutely precious and made sure that we were taken care of after two days of a travelling nightmare with Allegiant. Thank you Susan, your hospitality was impressive and will not be forgotten. This unit is directly on the beautiful coast, conveniently located to restaurants and shopping, and the perfect oasis for your vacation. I LOVED the garage space for the car and the wonderful assortment of beach toys and necessities that were available for use with the condo. You literally don't need to worry about a thing--it's all here. Thank you Vic and Susan we certainly hope to return soon. We meet and greet many people and we have to say that you and yours were truly a treat to welcome to the Peach on the Beach. OK, so it was not on your booked arrival date, but we did the best we could to make up for Allegiant's cancelled flight and so the delayed arrival. Better late, than never. We enjoyed having you and yours and certainly look forward to your next visit. This was our 3rd time at this condo, That's says it all, great position, spacious, well fitted out and maintained. An absolute dream of a Holiday Condo. Look no Further you will not find better. Just a few words as a summary: We'll be back next year and we count the months. Ein paar Stichworte auf Deutsch: Wir machen seit fast 20 Jahren Urlaub in diesem Gebiet, das Peach on the Beach ist bei weitem das sauberste und bestausgestatteste Condo in diesem Preissegment. Nicht günstig, aber seinen Preis wert. Sehr freundliche Eigentümer, die sich um ihren Besitz auch kümmern und Sorge dafür tragen, dass es so gepflegt bleibt wie es ist. Nächstes Jahr wieder! WOW! what a GREAT review and thank you so very much. You guys were great to have and we are so pleased to hear that you plan to return to our PEACH ON THE BEACH. VRBO changed how reviews were to be submitted and either did not advise us or we failed to notice. Anyway, you got your (our) review in and we loved it. We still do wonder what the German part said ???? Guess you can tell us during your next visit. -- FLASH -- 'Beach within Reach' and condo is a 'Peach'---(on the BEACH). One of a kind and YOU will love it as you look out from YOUR private balcony directly at the Gulf of Mexico. Or you can look, right (north) and or left (south) the beach and see what amounts to miles of open beach. The "super" unit is kept Ultra CLEAN and ready for your visit. We do weekly bookings, generally on a Saturday/Saturday basis. We are accepting weekly bookings for the rest 2017 & 2018, generally on a Saturday to Saturday basis. We think you will enjoy working directly with the owner/Susan, as she is always willing to answer questions and offer friendly advice. Also, suggestions for improvements for your return visit or for others are always welcome and appreciated. After all we do hope you will return every year to see what we have new and different. We are open for most weeks during the fall/winter seasons, of 2017. Top Floor (of 5) and Direct GULF view --- with garage --- one of BEST beachfront buildings on the entire beach and one of the best units in the building. Hard to beat !!! What a perfect VIEW !!! Take a peak at our pictures. Check out our calendar and be sure to read all of our five star REVIEWS. Can they all be wrong? FREE high-speed WiFi, with HD TV in Living room and flat screen cable in both bedrooms. We have NEW living room furniture for your enjoyment. Also, we have just added a trey ceiling in the kitchen with new LED lighting. Indian Shores is located on the barrier islands midway between Clearwater Beach to the north and St. Pete Beach to the south. Great restaurants, shopping, and grocery stores are conveniently located within a 5 mile radius of the property. The airports and interstate can be easily reached by crossing the bridge to the mainland, just .02 of a mile north of the condo complex. Explore our open beaches for miles in both directions. The trolley stop is near our parking lot and offers scenic ride for a nominal fee. The condo is recently painted and updated, as our pictures show. Take a look at our testimonials. Happy visitors wrote them. Stay with us and write your own happy testimonial.